Of the people most responsible for the restoration of Busongora Kingdom, the Late Hon. Yombo Kasonsoleko Yowasi, was one whose belief in the Basongora community was unwavering. He was a social reformer, a preacher and prophet. He worked hard to end the scourge of alcohol abuse, depression and superstition that were rife in the Basongora communities in the Congo and in Uganda. 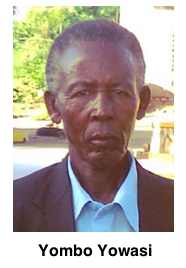 At the time of his passing he was the leading member of Busongora's Council of Accession.